Formed after the community lost their homes in two devastating earthquakes, Düzce Hope Homes is the result of a 15 year rights-based struggle in Northern Turkey. Following the earthquakes, which killed over 18,000 people and destroyed 100,000 homes in 1999, non-homeowners did not receive post-disaster support from the government. Over 140,000 people were left with nowhere to live except prefabricated emergency shelters. A co-operative was set-up to fight for the right to housing to be extended to tenant victims of the earthquakes. Through many years of mobilisation and activism, including mass demonstrations and government lobbying, they eventually secured subsidised land on which to rebuild their homes and community. Co-operative members have been involved in the planning, design and construction from the beginning. Groundwork on the houses has begun with people expecting to move into their new homes in 2018. This community-led approach is so unique in Turkey that it has received widespread interest, support and enthusiasm from experts and volunteers. Historically, experts (such as architects, urban planners, civil engineers, social scientists, artists and construction workers) work on developments in siloes, distant from the people who will live in the homes when built. Through this project experts, communities and volunteers have found and embraced new ways of working together more collaboratively. Düzce Hope Homes is a cooperative housing programme focused on post-disaster reconstruction in the Beyköy district of the province of Düzce in Northern Turkey. But the programme is about much more than the housing itself. The achievements of the cooperative in gaining access to suitable, subsidised land and developing secure, affordable housing for some of the province’s most vulnerable families is the result of a 15 year struggle for the right to housing. The Düzce Hope Homes programme was established by Düzce Solidarity Housing Cooperative for Homeless and Tenant Earthquake Victims, a cooperative founded by local people in 2003. Four years previously two devastating earthquakes had hit the area killing over 18,000 people and destroying over 100,000 homes and leaving over 140,000 people with nowhere to live except prefabricated emergency shelters. 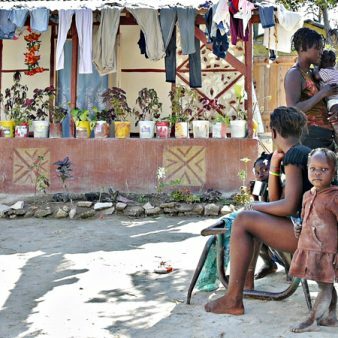 When their homes and community were destroyed, people joined together to create their own housing solution. Most of the reconstruction work that took place in Turkey after the 1999 earthquakes was based around homeowners – this project extends the right to housing to renters. The Düzce Solidarity Housing Cooperative for Homeless and Tenant Earthquake Victims was formed to address the fight for the rights of those on the lowest incomes in the community. In the same year, 2003, the cooperative organised the first of a series of mass demonstrations, involving hundreds of people in collective protest on the streets demanding subsidised loans and serviced land. Initially in Düzce and later in the capital Ankara, these protests included encampments of affected families in the capital’s parks. In some cases those involved were taken into police custody. In 2004, after much lobbying and direct action the government’s Ministry of Urban Development and Housing allocated six plots of land for the housing need of low income residents. The land initially offered by the state to the cooperative in 2004 was unsuitable and it took until 2012 following further direct action and a legal challenge by the cooperative for suitable land to be handed over to the community. The mutual aid approach of the programme has meant that future residents have been involved at all stages, including actively getting involved in lobbying for their housing rights as well as in the development of plans and designs and in the construction work. A team of professionals who volunteer their time to the programme has formed Düzce Hope Studio, a collaborative design studio in Istanbul. This group of volunteer architects, engineers, urban planners and sociologists was formed in 2014 to support Düzce Hope Homes with designing and building houses with the involvement of local residents. 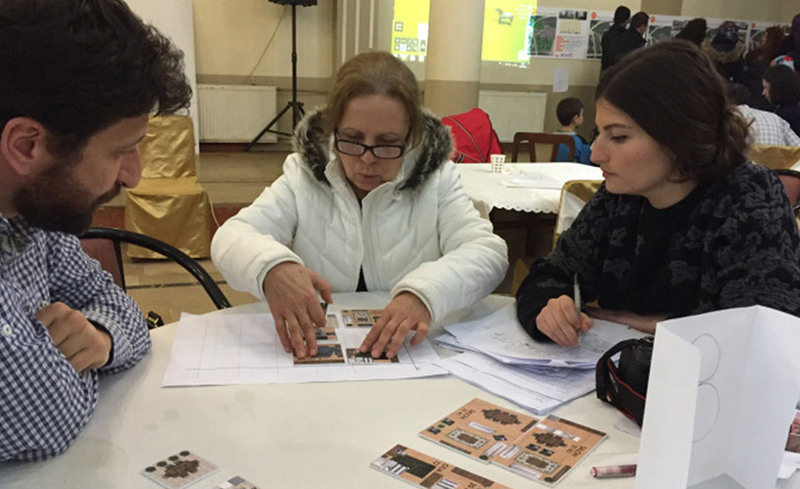 The participatory workshops and activities run by Düzce Hope Studio which have been a key part of the development of the programme have included specific workshops for different sections of the community including children, older people and women. Now, the work of the cooperative involves more than 300 people (four full time employees on the site, around 40 members regularly work on the site, 234 cooperative members working once a week and 50+ volunteers from Düzce Hope Studio, a collective of volunteer architects, engineers, urban planners, and sociologists). Have no existing ownership of property. Work one day a month per household at the construction site. Participate in the design and management of the project. 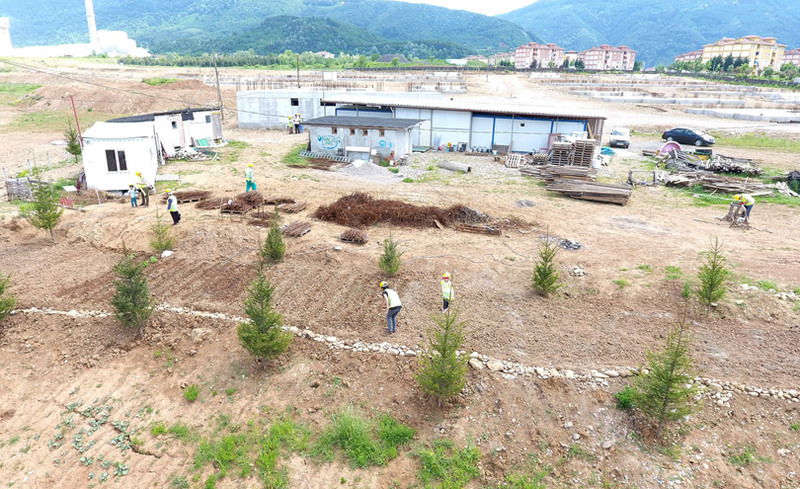 Were resident in Düzce at the time of the 1999 earthquake.The significant progress the cooperative has made to date in lobbying for rights and achieving access to land has formed the basis for the actual construction work. The groundwork of the housing units was successfully completed in October 2016, two years after paying the first instalment for the land. The site on which the housing is being built is on a hillside situated between a government built mass housing project and an industrial area including a large glass factory. Some communal facilities, such as an organic garden, have already been completed. The development is expected to be completed by 2018 and will include 234 housing units for members, three housing units for the building concierges – for a total of one thousand people in 29 buildings. There will also be a community centre, urban gardens, a women’s cooperative kitchen and public spaces. These public spaces will benefit an additional 5,000 people in the district. The main aim of the work of the Düzce Hope Homes cooperative is to ensure the right to permanently affordable housing for earthquake victims, in particular for people who were tenants before the earthquakes. Persistent activism, campaigning and lobbying for change. Active community participation in advocating for the right to housing for all, including some of the province’s most marginalised communities. Participation of the community in delivering their own housing including sweat equity. Collaboration between professionals (e.g. architects) and communities to develop housing that fits with local needs and preferences. Ensuring permanently affordable housing for local people on low incomes. Building more resilient and environmentally sustainable housing. Creating strong neighbourhoods which go beyond housing. Improved public and communal spaces for community use. 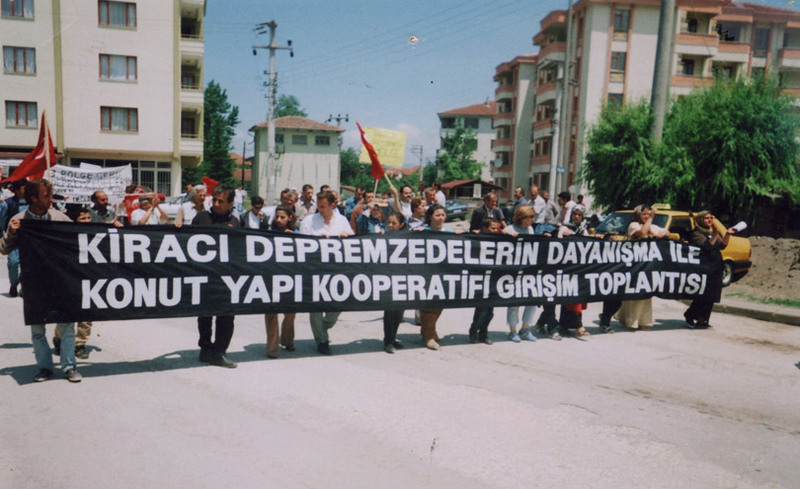 From 1993 to 2002, there was a decrease in the development of housing cooperatives, in part due to the major economic challenges facing Turkey. The state reduced its financial support and existing housing co-operatives experienced operational deficits, the price of land rose and people’s ability to save money was also affected by rising prices. In August 1999, a major earthquake hit the Marmara region of Turkey and this was followed by a second quake in November of the same year, the epicentre of which was the province of Düzce. Between 2001 and 2005, 57 houses were built by villagers working together and with people from outside the villages but many more families were left living in unsuitable housing. Prior to the development of Düzce Hope Homes cooperative the government support for the victims of the earthquakes was only focused on homeowners, leaving tenants without any funding or rights to housing. Focused on and delivering the right to housing for everyone in the community, particularly people on low incomes. Ensuring the long-term affordability of housing. Using the actual development and construction as a way of building collaboration and a real sense of community. Cost savings as the cooperative has managed the process themselves, sourced materials directly from producers and due to members’ ‘sweat equity’ contributions. A Women’s Production Cooperative is in the process of being formally registered, although production has already started. This initiative has been established to generate income and the construction of a cooperative kitchen. There are five different designs of homes, which are customised to meet the needs of different family sizes or types. These designs are based on a participatory design process including one-to-one sessions with each family. A central courtyard system and community spaces were designed to bring neighbours together and encourage a strong sense of community. A proactive approach to getting support from volunteers from other countries, with international collaborations and strong partnerships set up as a result including ‘task forces’ of hands-on workers and professionals. One Hope Association is a voluntary organisation which supports low-income urban communities with regeneration projects. They helped with advice on health and safety standards for workers and were involved in providing aid immediately after the earthquake. 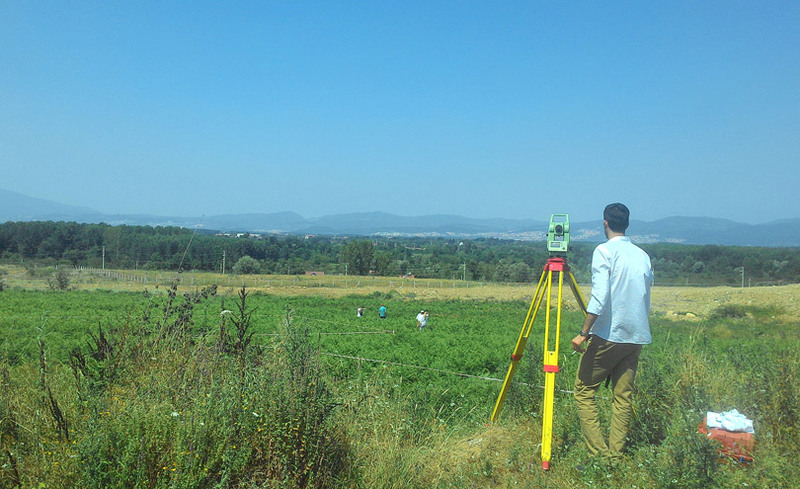 The Düzce Hope Studio has provided volunteer architects, engineers, urban planners and sociologists. It was set up after an open call from the One Hope Association specifically to support the cooperative. The local council in Beyköy was in charge of zoning approvals and planning permission. Local Planning and Design Schools and the Centre for Spatial Justice provided technical support, volunteers and fundraising. The Swiss Housing Cooperatives Solidarity Fund financially supports members on the lowest incomes with a ‘social safety net fund’. The policy context in Turkey has been influenced directly by those involved in the Düzce Hope Homes cooperative development. At a national level, securing the right to land and housing for non-home owners on low incomes after natural disasters is a significant achievement of the project. Through a determined campaign of activism, at a local level the cooperative has successfully gained access to suitable, serviced land for families and are on track to complete the first mutual aid housing cooperative in Turkey. Some of the current members of the cooperative were children when the earthquake happened in 1999. Many have joined their parents in fighting for their right to housing, leading to community action across the generations. Düzce Hope Studio is a space for architects, urban planners, civil engineers, social scientists and artists to work together towards a social aim. They have organised and launched public events, exhibitions and publications. This has helped to introduce participatory planning and design to the wider urban planning and design community in Turkey. The Studio receives invitations from other cities in Turkey to share their experiences. The proactive approach to collaboration taken by Düzce Hope Homes has inspired people to join and help and has attracted lots of goodwill, for example, from local construction workers and bank managers who have started volunteering for the project. The local council is now more willing to provide affordable housing within the district and some private developers have adopted participatory practices within their work. 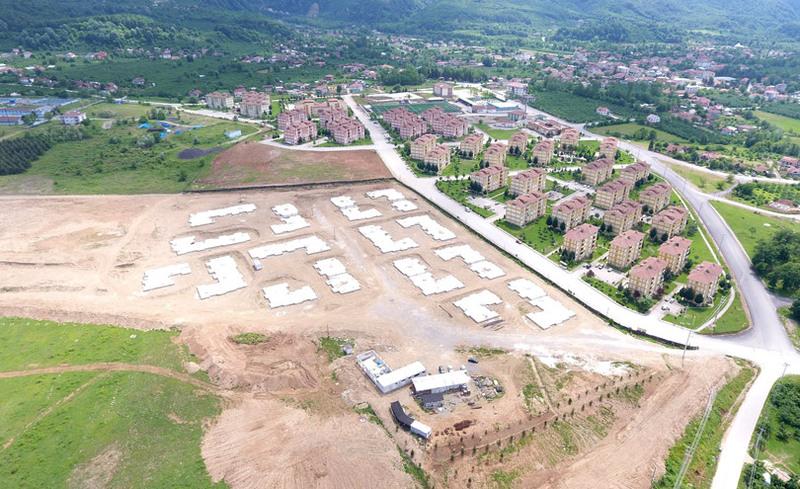 Land payments to the Mass Housing Authority – 2.3 million Turkish Lira (US$647,122) of which 460,000 Turkish Lira (US$129,424) has already been paid. 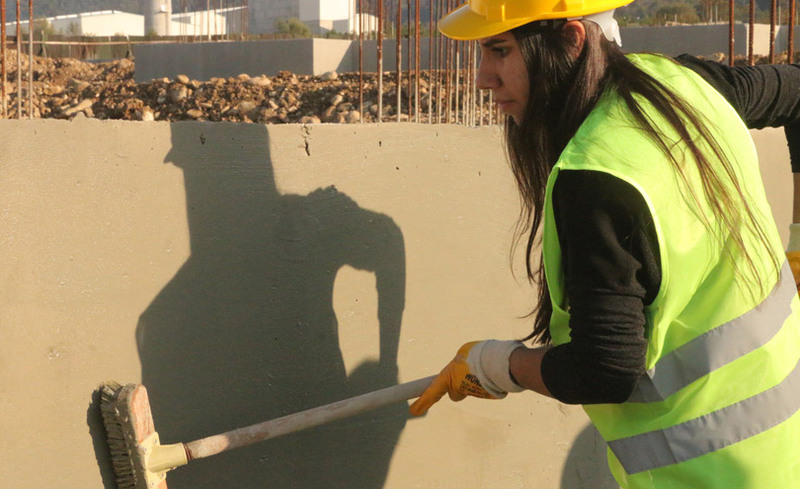 Groundwork – around 3 million Turkish Lira (US$844,072) has already been spent. Rough and detail construction – around 11 million Turkish Lira (US$3,094,930). The expected costs of construction for the next two years are 15 million Turkish Lira (US$4,155,355) which will be paid from cooperative membership fees and bank loans. 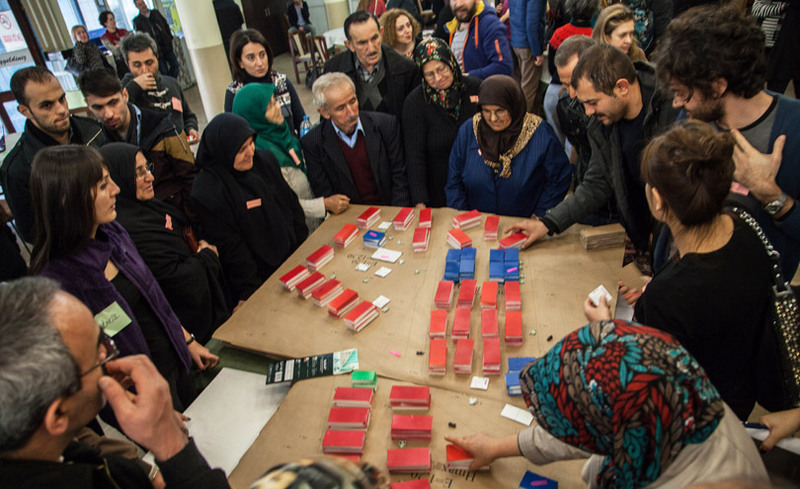 As interest rates on bank loans are very high in Turkey, the cooperative is seeking alternatives, including funds or loans from international development agencies. The expected costs of the project after the construction will be mainly on the maintenance and management of the site. Once the construction is finished, an average unit cost (76,000 Turkish Lira) (US$21,053) will be lower than the cost of the cheapest two bedroom flat at the neighbouring government mass housing project (110,000 Turkish Lira) (US$30,472). The average cost to residents of renting a housing unit is approximately 600 Turkish Lira (US$168.81) per square metre. This is half of the current market rate in this area. As the project is not yet complete, the annual running costs are not yet clear. However, these will include rubbish collection, cleaning, maintenance, electricity for public spaces and managing the community centre. Community facilities will generate income through the Women’s Production Cooperative, an organic food market, a repair shop and a children’s nursery. Some of this income will go towards the site management fund for annual running costs. The quality of housing available to people in Turkey is generally determined by income. Victims of the 1999 earthquakes started this programme, which is the first tenants’ movement for low-income people fighting for their right to adequate housing. This is the first mass housing project in the country to be planned and designed by its residents. Their housing needs have been identified by the cooperative members themselves. A participatory approach to delivering affordable housing has never previously been on the national agenda. This mutual aid, hands-on approach to cooperative housing is much more common in other parts of the world, particularly Latin America. This cooperative signifies a first not only for the post-disaster context in Turkey but in fact mutual aid has not been adopted in any previous housing development in the country. The approach goes beyond housing as shelter by encouraging strong neighbourhoods and a sense of community. The truly cooperative approach taken at all stages of the development of the programme means that it is much more likely to survive as a cooperative once the houses are lived in, unlike the majority of the existing housing cooperatives in Turkey. Longer term affordability of the housing for low income families is therefore much more likely to be assured than in other schemes. Innovative cost-cutting measures have been developed, which have lowered the cost of the first construction phase. Workshops are held for members, the technical team and construction workers. These bring everyone together to decide on materials and techniques to be used. Materials are purchased directly from producers. This has helped to make the homes affordable to those on the lowest incomes. To keep the homes affordable long-term, members are not allowed to sell to third parties without approval from the cooperative. Nineteen different materials for the exterior walls of the houses were studied by experts at Düzce Hope Studio. Based on this study, five options were presented to the cooperative and the most energy efficient option, aerated concrete, was chosen. This is light, porous and naturally improves heat insulation. Where possible, building materials have been sourced locally. Soil needed for ground level construction was sourced directly from a landfill site next door, reducing the need for transport. Sustainable local wood has been used for building the community centre. Cooperative members have learned about producing compost from organic waste and recycling. The compost created by waste from the community kitchen is used at the community garden. They are looking into ways to use solar panels for heating and electricity at the community centre and also in the housing units when completed. Any expected costs for the future will be mainly for the maintenance and management of the buildings and gardens. These costs will be met by residents’ monthly membership fees and income generated by the cooperative. There are plans to build a community oven, which will be used to make and sell bread. Any profits on the sale of bread and money generated by the women’s cooperative kitchen will be help to bring income into the cooperative. The project itself is not reliant on any future funding streams. However, the speed of the remaining construction works will be affected by the availability of future funds. This may delay the completion date. The funds and labour contributed by the cooperative are secure. Membership fees for the cooperative will be increased once residents move into their new home to incorporate their monthly rent. This means that residents don’t pay rent for properties in the cooperative at the same time as construction costs. Members on the lowest incomes are helped to pay their contributions with assistance from a fund set up by the Swiss Housing Cooperatives Solidarity Fund. Employment is created both during and after construction. All employment will be kept within the cooperative, helping to strengthen the financial position of its members by providing jobs and incomes. The strong sense of involvement and collaboration between local people has really strengthened the sense of community and has also strengthened the social ties which will be so beneficial once everyone is living in the new housing. The project has reduced social inequalities by providing extra support to some of the most disadvantaged people in the community. This includes a ‘social safety net fund’ for financial assistance (in the form of a relief fund to help pay the rent of members if they lose their job), employment opportunities and the Women’s Production Cooperative Initiative. This promotes gender equality by supporting women to get involved in income generating activities. Women-headed households represent almost half of the total number of households (106 families). By improving the local infrastructure and public spaces, Düzce Hope Homes cooperative promotes the integration of cooperative members within the wider community. It also improves the whole area for neighbouring households. Düzce Hope Studio has helped the local council to redesign a public community hall and the courtyard of a local mosque. The completion of the multi-purpose community centre creates opportunities for members to develop their skills through the classes which are held there. An active and healthy lifestyle is encouraged. There is an urban agriculture initiative on-site to produce local healthy food for members. The community centre will hold an ‘Open Institute Programme’ for the wider community. The aim of this programme is to raise awareness of earthquakes and encourage families to be prepared, advocate for the right to housing, promote participatory housing and demonstrate that housing is more than just shelter. Local people and the members of the cooperative in particular have gained more confidence in addressing the government and public sector organisations in order to achieve their objectives and establish their rights. Before this programme started there was a perception within society and the local authorities that tenants did not have the right to decent housing. This attitude also had an influence on the cooperative members themselves and initially it was a challenge to change the members’ perception. Previous housing cooperatives in Turkey were not viewed as inclusive or democratic and experts from different disciplines were not included in the development process. In Turkey housing is often considered to be an investment rather than a human right and this programme has taken an entirely different view. These barriers were overcome by empowering tenants to create a movement fighting for their right to housing. It was important for people to learn about the existing legal framework so they could challenge the authorities. Some of the professionals working with the residents were not used to working directly with communities, particularly when they were so actively involved in the decision-making. This caused some issues initially but as this was such an important, strong feature of the programme, the professionals soon became familiar with how to adapt their approach to accommodate community involvement. People must be persistent and insist on their right to safe, secure housing. It is important to understand and use legal rights to overcome barriers. Negative perceptions of cooperative housing can be overcome by developing a positive, community-led example. Changing perceptions on the right to housing. Including different groups in the community, such as women, older people and young people. Affordability for the lowest income families. Transferring knowledge and skills from experts to members of the cooperative. The project has been featured in local and national newspapers, online journals and on television. Several university research projects have focused on the work of Düzce Hope Homes and since the construction site is open to visitors, they regularly host people from Turkey and overseas. The Neighbourhood Union, Volunteers for the Society, Chamber of Architects, Lawyers for Environment and Urban Justice, students and academics from several universities are among those who have visited. The legal framework of the cooperative can be replicated in other neighbourhoods and within other housing cooperatives in Turkey. The participatory approach to planning and design can be used more widely, including state-wide housing projects. The cost-cutting measures used by the cooperative can be replicated by other low-income housing projects. The entire Düzce Hope Homes model can be transferred to other tenant groups in Turkey. This includes creating a democratic housing cooperative which is self-financed, demanding subsidised public land for building on and having the full participation of residents. 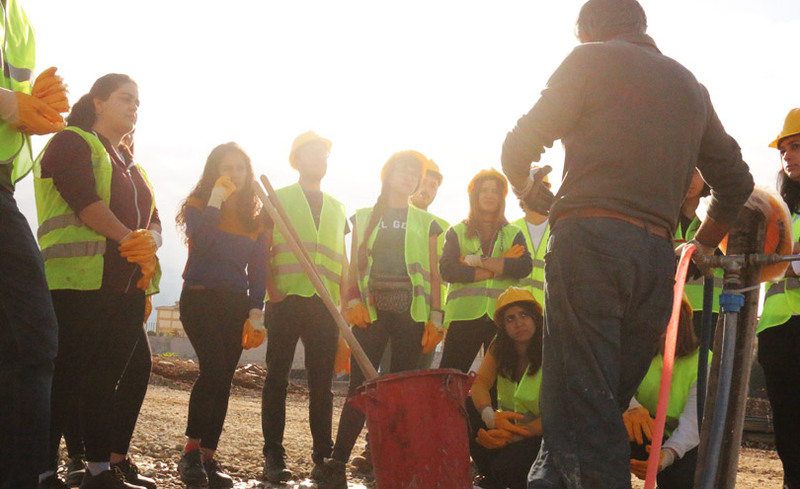 The ‘open site’ approach of the construction site has enabled the cooperative to share what they are doing with people and organisations from within and outside Turkey. The ‘Open Institute Programme’ will teach the wider community about the risks of earthquakes and advocate for the right to housing. It will aim to transfer the knowledge and skills gained by the cooperative to others locally. Düzce Hope Homes is also affiliated with the Neighbourhood Union of Turkey, a network of 50 informal groups from neighbourhoods facing urban regeneration. The cooperative has been active in sharing their experiences through this network. The project organised the HOPE Exhibition at Studio X (Istanbul) in 2016 to share their experiences at a national level. In 2015, they took part in the Antalya International Architectural Biennale. Members of the cooperative have started a documentary film project and an online video platform. This has over four hundred videos about Düzce Hope Homes. They have also taken part in conferences at a number of universities including Harvard, University College London and American University of Beirut. 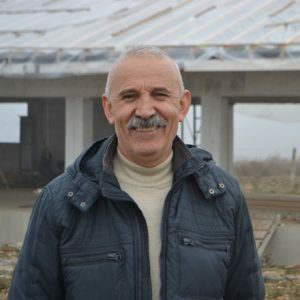 Dursun Teper is 64 years old and a member of the Düzce Solidarity Housing Cooperative for Homeless and Tenant Earthquake Victims. Until fifteen years ago I had lived hopelessly. The reason for my hopelessness was the fact that I could not own a home. It was at this time when the 1999 earthquake hit. We were devastated. Following the earthquake the state built houses and provided property owners with apartments. We were living in prefabricated houses when we discovered that we, tenant victims, also have rights. Our hope started to grow. The cooperative was set up and the legal process began. We started to fight for our rights. We have achieved things that we never believed we would. My best regards to everyone who has supported and contributed to our efforts.